Last week we wandered near Artist's Rep Theater with friends. 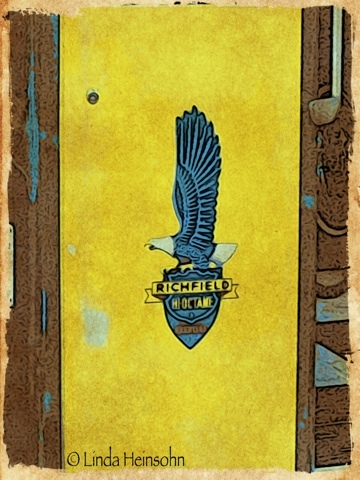 I loved the old Richfield gas pump, in all it's bright blue and yellow glory, in a car collector's window. With that photo, I decided to learn more of what Moku Hanga app can do. The answer is, quite a lot! different paper layers to select for photomontage effects, color selection and adjustment, effects styles to apply. Could have been lost in there for hours! Oila! Hi Linda: I like the "Eagle". Good job playing with Moku Hanga, I found it too easy to overdo a photo with that app, but you seem to have avoided that problem. Good job here, both with the photography & app use. Thanks, Judy! I agree with you on how easy it is to overdue the effects in Moku Hanga. LOL. Took me a long while last night to realize the effects were cumulative so I started over several times before I got the hang of it. But it was 2 in the morning and I was awake, so I had plenty of time. Have been a lazy photog for the past six months. Very, very lazy.